This describes the problem quite perfectly. You would never eat rancid fish - trust me, if you did it would take the same way out, it went in. Try the same with rancid fish oil caps and you will at best suffer from burping. Could be a sign your some of the "real fish" that stinks and warns you that a fish is rancid is still left in your oil, but I don't have a study to prove that. Carl mentioned it on the Science Round-Up, but we did not really get to it, so I thought it would make a nice headliner for the weekend. A headliner, of which I have already pointed out that I doubt it will be responsible for the prostate cancer issues with fish oil (see Thursday's news). It does, allegedly, sound logical that the consumption of oxidized (=rancid) fish oil would precipitate the development of cancer, but it is not logical why this would happen in the prostate, yet nowhere else. On the other hand, rancidity could, as this recent study from the Miguel Hernandez University in Spain goes to show you, well negate the beneficial effects I enumerated at the end of the previous article and what's particularly nasty about the whole business is that it's hard or rather impossible to spot, whether your fish oil is rancid. 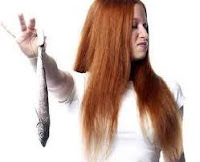 With real fish you would start to vomit it up again, as your body knows that the smell and taste, which is largely due to components that have been filtered during the industrial manufacturing process of fish oil, is not good for you. It is thus no wonder that popping the highly oxidized (=totally rancid) fish oil caps was not much of a problem for the 57 female participants of the study at hand. The women all suffered from dyslipemia (250–300 mg/dL and TG 160–175 mg/dL), but did not yet receive any medical treatment. During the one-month intervention period, all participants attended face-to-face training sessions, receiving instruction manuals that included a personal sample meal plan, recipes and information regarding physical activity. Body weight, height and blood pressure were repeatedly measured under standard conditions. 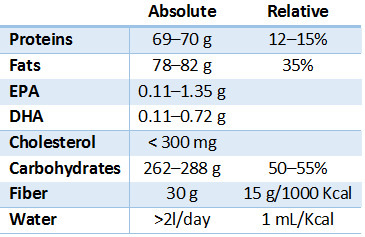 You can see the daily intakes of long-chain omega-3 fatty acids in table 1. The daily energy expenditure was estimated according to Harris– Benedict equation. Now I do agree, this does at first sight not look exactly like your typical supplement study and you are right. In my humble opinion the overtly healthy baseline diet and even more so the high amount of fish is a major design flaw, which will obviously reduce the validity of the results in a real world Western diet scenario. In this scenario there are almost no intact omega-3 fatty acids in the baseline diet to counter the potential negative effects of rancid fish oil, so that the it is all the more remarkable that the scientists were still able to observe significant interferences with the blood pressure lowering and cholesterol normalizing effect of the fish oil in their study (see figure 1; additional benefits on BMI & co were not observed, by the way). If you scrutinize the data you will recognize that the dietary change alone yielded albeit non-significant reductions in total cholesterol, for example, that were actively reversed by the ingestion of 2 fish oil caps/day with a rather mediocre oxidation level of 47.67meq/kg, which is ~50% of the highest levels the researchers found in their batches of commercially available fish oil products and ~3x more than in the oils the other group received (peroxide level: 16.98meq/kg). So how rancid is commercial fish oil, after all? "[...a]ll brands presented similar peroxide index after 6 months compared to time 0, indicating that the quality of the initial product rather than storage conditions was the main determinant in the oxidation of encapsulated oils. In other words, contrary to what I claimed on the Science Round-Up, storage (out of the sun, cold, etc.) does not seem to pose such a great risk for oxidation. At first this struck me as being quite odd. 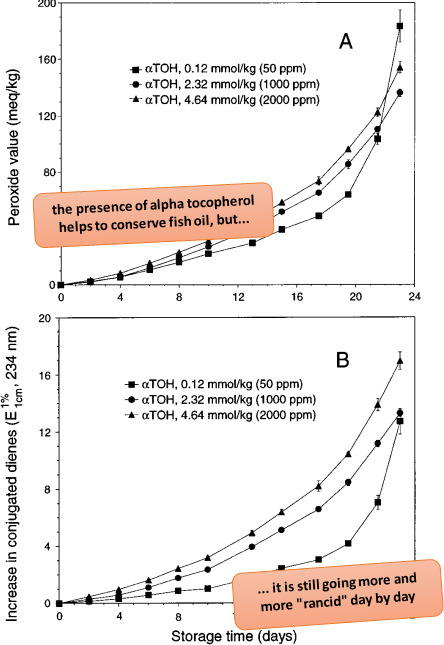 Not because I am infallible, but rather because it contrasts the data in figure 2, which shows the results of a 2001 study by Kulas & Ackman in the course of which they tested the oxidation rates for fish oil with different forms of vitamin E that were stored protected from sunlight, but at 30°C (obviously not optimal, but not unrealistic in the warmer climates, either). There is yet one significant difference I did not take into consideration at first and that's the lack of oxygen exposure, when the fish oil is properly encapsulated. Contrary to the caps the Spanish researchers had bought, the fish oil in the Kulas study was stored in a brown, yet not air-tight bottle. It's quite obvious that the oxidation process will stop, once all the oxygen that may have been inside the caps has been "consumed". So that it appears plausible to assume that your fish oil, as long as you buy it in caps and not in a bottle, will last a couple of months without going even more rancid than it was, when it left the manufacturing plant. So what can be done? If you still want to take your beloved fish oil? Well, one thing should be obvious: (A) Don't buy bottled fish oil! Whenever you open the bottle you'll restart the oxidation process. Another thing you may do in case you insist on supplementing with fish oil instead of simply eating fish, is to (B) buy fish oil from a supplier who has the peroxide index of the final product controlled for each batch by an independent lab. And (C) chew your fish oil caps! While the taste is not as bad as with rancid fish, you still got a chance to identify whether your fish oil is rancid - if it has not or not totally been cleansed. In fact, a 1975 study by Huss et al. suggests that the highest "acceptable" (=does not taste off) peroxide index for crude (not processed) fish oil is only 7-8meq/kg, which happens to be less than the "best" fish oil in the study. So, in case "your" fish oil doesn't just taste like dead fish, but rather like dead fish after being stored in the heat for weeks, you better try to find another source. Djoussé L, Gaziano JM, Buring JE, Lee IM. Dietary omega-3 fatty acids and fish consumption and risk of type 2 diabetes. Am J Clin Nutr. 2011 Jan;93(1):143-50. doi: 10.3945/ajcn.110.005603. Epub 2010 Oct 27. Huss HH. 1975. Principal changes during storage wet fish FAO/DANIDA training course on quality aspects in the handing and storage of fish 4, Copenhagen (Denmark), Rome (Italy): FAO, 15p. Kulås E, Ackman RG. Different tocopherols and the relationship between two methods for determination of primary oxidation products in fish oil. J Agric Food Chem. 2001 Apr;49(4):1724-9.